This scarf was particularly challenging. It was my first double-knit anything and I had to translate a mitten pattern into a scarf pattern. Thankfully, Rosslyn likes short scarves! First bit of progress, learning the ropes and beginning to like what I'm seeing. Finished my first set of three Feegles, with the next set on the way. And this was after finishing the blank middle which felt like forever even though it was shorter than the ends. And done, with fringe added! I finished this over Thanksgiving weekend. 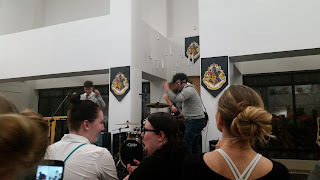 I went to a concert at my local library with my friend Camilla and saw Harry and the Potters for the first time. I did enjoy their energy and fun music--I definitely recommend them! I can finally begin posting Christmas gifts! Though only once the recipient has seen/received them. Tara asked me to make her some classy mittens, something to wear when she wants to look nice, something more subtle than the ones I made her last year. Having plenty of black yarn, I was happy to oblige. 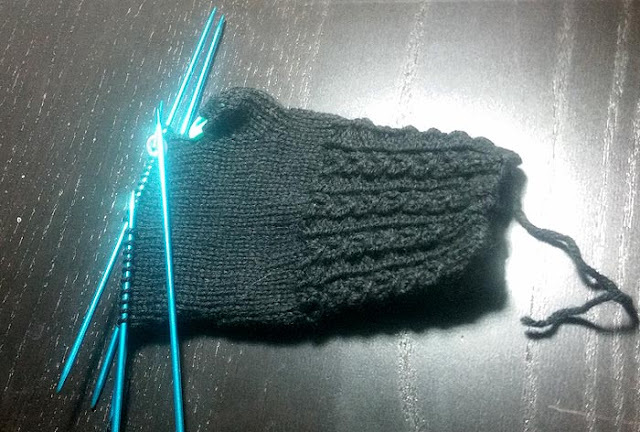 I like the fun little leaf cabling on the backs of the mittens. But, they are pretty hard to take a good photo of. Tara does seem to highly approve of and enjoy them, so they are a success! 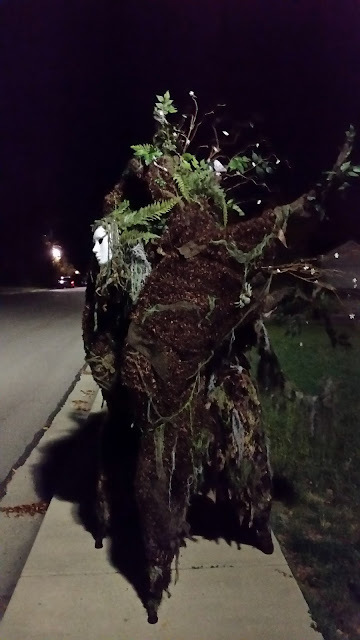 I mostly just want to show this amazing costume/rig Rosslyn did this year. I walked around keeping an eye on her and being her advocate for the terrified children (or the extremely curious children--we had one cute 4 year old playing 100 Questions). We'll be upgrading it a bit for next year but the kids wanted us to promise to return, so you might be seeing better shots of this next year! I'm a little behind on this due to the craziness that was November, but! I want to catch up. This party was at Rosslyn's parents' home and as usual it was AMAZING!! They really know how to party. Check it out. 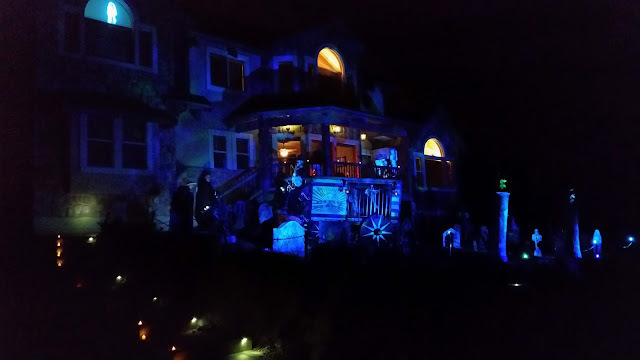 The front of the house was fully decked out with the creepy circus theme in the graveyard, with ghosts in the windows and a circus cart on the lawn, smoke billowing... It was so freaking cool. Her cousins, also in the circus theme as fortune tellers (I think, not too sure). She was an elf ranger. Rosslyn's father, the vampiric ring master. Her sister and her husband, a green Martian and an astronaut. Her cousin's husband as the bearded lady. Rosslyn's cousin as the tightrope walker (wife of the bearded lady). 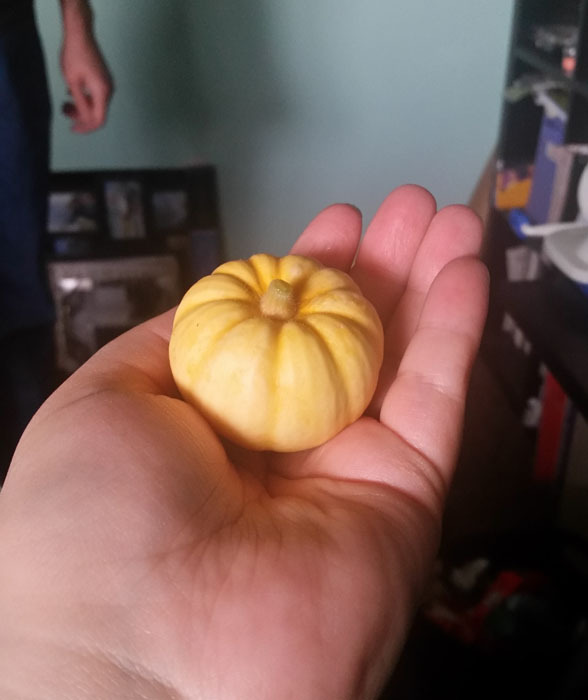 I named it Patty Pumkin after my mom. By far my most favorite thing out of our garden this year. It's still sitting on my doll shelf. The picture should be roughly life size. So, this past Saturday, Spousal Unit and I attended our niece's funeral. She was seven years old, nonverbal autistic, and died of an infection that went septic after she defeated her neuroblastoma. Through her cancer fight, many disabled children will now receive the same cancer treatments as non-disabled children do, due to a letter-writing campaign and various other methods her parents fought long and hard for. Congress, and the FDA responded to it and approved the changes. Her short life has affected so many people for the better. There are so many things I won't forget: her smile, her giggles when you clapped for her, her enjoyment of circles, and her love of dancing around the house with her Bear... none of that will be forgotten. It's not fair, no, but she's not gone. She will be missed, but we will see her again.